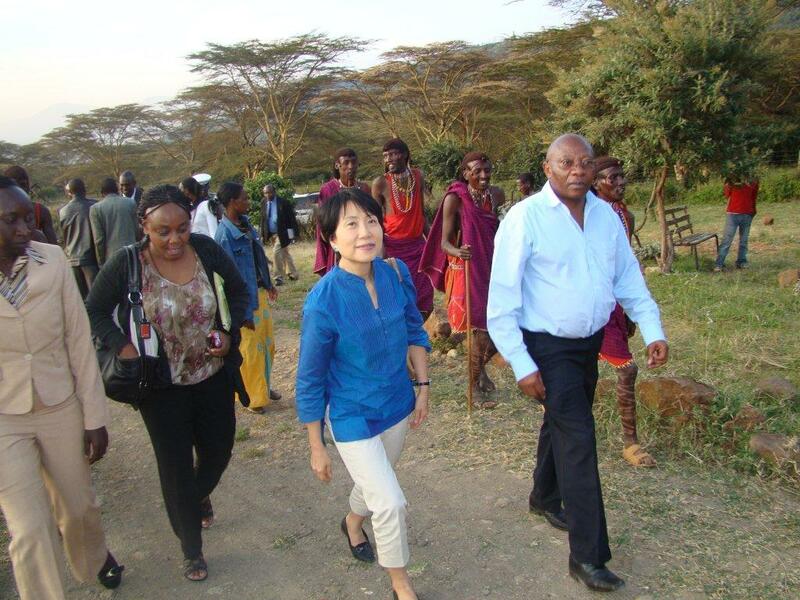 September 10, 2012, the new CEO of the Global Environment Facility (GEF), Dr. Naoko Ishii, visited a GEF Small Grants Programme (SGP) project site located in the Kikuyu Escarpment Forest in Kiambu County, Kenya. 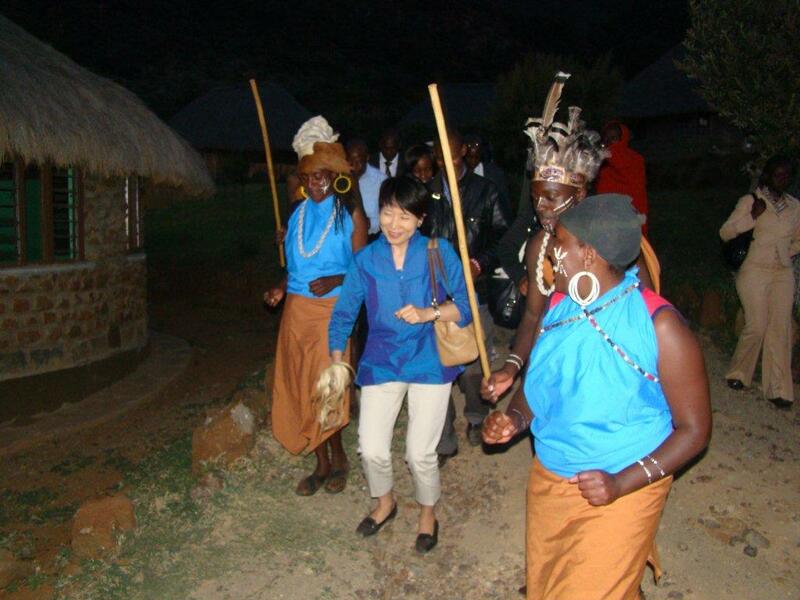 The GEF SGP country team and the project grantee organization, the Kijabe Environment Volunteers (KENVO), took Dr. Ishii to the Osotua camp, a community camp that was established with the assistance of GEF SGP and KENVO and is governed by two ethnic groups, the Maasai and the Kikuyu. This camp plays a critical role in promoting peace between these two ethnic groups, which have had conflicts over natural resources in the past. Equally shared responsibilities and benefits for both ethnic groups with a board of directors comprised of members of both communities ensure peace and create the basis for communication and collaboration in environmentally sustainable forest management. The Kikuyu Escarpment Forest is an Important Bird Area (IBA) and home to a variety of animal and plant species that are threatened from years of unsustainable activities such as timber harvesting, commercial fuel wood harvesting, encroachment, destruction of catchment sites, overgrazing and poor resource management. High poverty and the lack of opportunities to involve the local community in participatory management of the forest have put additional pressure on the ecosystem in the past. In order to conserve the Kikuyu Escarpment Forest by empowering the peri-forest communities in using a Participatory Forest Management approach, the youth group KENVO spearheaded the project "Awareness campaign and capacity building for community participation in conservation and sustainable use of the Kikuyu Escarpment Forests", which received technical and financial support from GEF SGP, implemented by UNDP. In addition to the GEF SGP grant of US$ 50,000 allocated under the focal area biodiversity, KENVO raised US$ 25,800 in co-financing for this project. Project objectives included raising community awareness on key environmental issues through participatory programmes around the Kikuyu Escarpment Forest; facilitating information sharing among local communities and groups that are engaged in forest conservation; developing and strengthening a school, youth and women environmental programme within the Kikuyu Escarpment landscape; and promoting ecotourism and bee keeping as alternative sources of income for the peri-forest communities to reduce the pressure on the ecosystem. During the project implementation period from September 2009 until September 2011, 2,000 people were directly reached through the awareness campaign activities, 20,000 trees were planted to rehabilitate degraded areas and a community action plan with monitoring and policing activities around Kinale Forest to curb illegal actions was established. Furthermore, this GEF SGP project supported the Community Forest Association at Kereita forest to finalize a Forest Management Plan and develop a Forest Management Agreement, both of which have been signed and launched. Through environmental clubs, the project also supported environmental activities in schools to include the youth and to promote sustainability. Matathia Primary School, one of the GEF SGP partner schools in the project area, is a model school that has won several awards, the most recent one being the Prestigious Green Award in July 2012. Furthermore, KENVO has received a number of awards for their outstanding work in the conservation of the important Aberdares Water Tower, which the Kikuyu Escarpment Forest is a part of. Among those received is the Equator Prize in 2009. In addition, Ms. Leah Mwangi, a programme officer at KENVO, was nominated as the UN Person of the Year Runner-up in 2011. 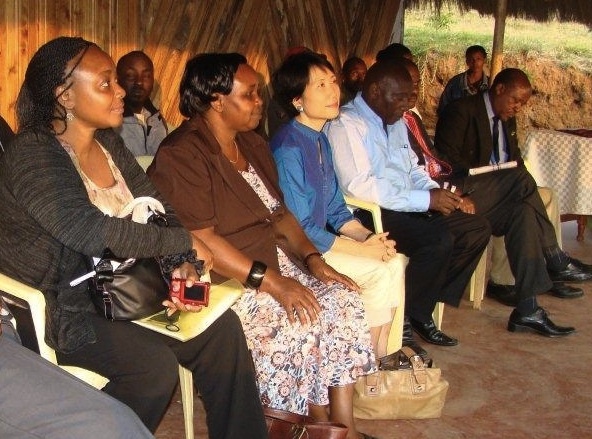 After a presentation on the objectives and results of this successful project, Dr. Ishii commended the communities for seeking innovative ways to promote peace, and thereby creating a conducive environment for dialogue and action on essential issues such as environmental conservation. She noted that the project used a multi-faceted approach to holistically address conservation and development for the improved well-being of locals, and congratulated them on their good work. Dr. Ishii also gave a personal example of her work with communities in Nepal, where she had a similar experience of promoting peace for conservation and development.